Nestled on a quiet cul-de-sac, this expansive two-acre property stuns with dramatic panoramic views of pristine lakefront. A spacious guest house further adds to this estates lush charm. Among the many upgrades, the main house includes andersen impact glass, voluminous ceilings, four oversized garage spaces, a large porte-cochere, natural stone and wood flooring, saltwater swimming pool, a wood-burning fireplace as well as a mother-in-law suite with its own separate entrance. No detail was overlooked in this custom home builders thoughtful design of their residence. Mature landscaping, numerous outdoor sitting areas, and an oversized lot all add to the feeling of privacy and appeal of this one-of-a-kind offering. Feel at home the minute you walk into this bright and open 5 bedroom plus den 4. 5 bathroom home. Located on a corner 1. 47 acre lot this home has so much to offer. Recently renovated with wonderful updates. Home has chestnut hardwood floors throughout and volume ceilings. A wonderful home to entertain in and equally wonderful for day to day living. The chef of the house will love the well-appointed gourmet kitchen with loads of cabinets and fabulous stainless appliances. The master bedroom suite is a fabulous retreat with his & hers closets and a luxurious bathroom. There is room for everyone with 4 more bedroomsthere are many places to gather together. Wander outside to the oversized lanai and relax in the pool. Steps away is a 2br 2ba guest house nestled on the property. A total of over 5600 square feet of a/c space. This home offers a perfect balance of privacy, elegance and comfortable living. All this in a wonderful location. Pine ridge is close to mercado, waterside shops, fabulous restaurants & shopping, beaches - near everything that you want and need. 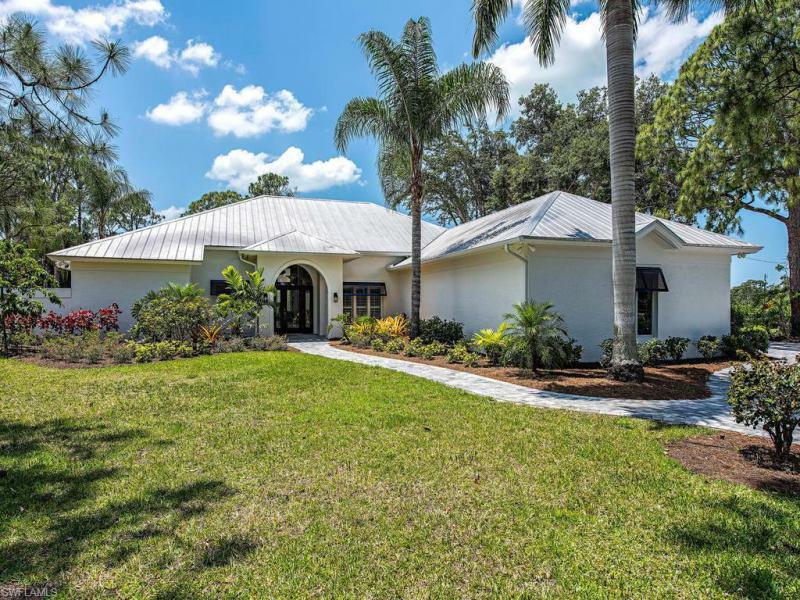 A wonderful lifestyle awaits you in the much sought after neighborhood of pine ridge estates. Additional photos to come. Welcome home to this meticulously maintained, waterfront home just blocks away from vanderbilt beach! This three-story, southern-exposure home provides over 6,000 sq/ft of total space, with 4 bedrooms and 3 1/2 baths. On the main floor, entertain guests with the gourmet kitchen with great room concept, relaxing afterwards on the private, expansive lanai. There are two large bedroom (one could be an office) and 1 1/2 baths. Retreat to the master suite with french doors lead you to an open lanai with gorgeous views of the water and florida sunsets, spacious master bath and 2 walk in closets. Your guests will enjoy another oversized bedroom and ensuite bath. The owners outfitted the ground level with a large entertainment space, kitchenette, office/bedroom and bath/pool bath. Numerous features and upgrades include new roof, impact windows and doors, private elevator with windows, soaring ceilings, central vacuum, three-zone a/c system, oversized two car garage, circular driveway, salt water pool and spa, boat house dock with 10,000-pound boat lift. This homes is conveniently located close to shopping and dining at mercato, beaches and dining. H. 14202 - this private jewel will steal your heart from the moment you step through the welcoming asian-inspired wrought-iron gates into the heart and soul of this unique home, the generous open-air tropical landscaped courtyard with 30' sunny pool and expansive 2400 square foot sun-bathed deck. This unique gem is architecturally designed to allow privacy for every family member via 4 distinctly separate bedroom wings, plus ample living, family, and loft gathering areas, too. Every room of both the main dwelling and the 2016 built cabana studio apartment proudly showcase tranquil, bright courtyard or peaceful rear zen garden oasis views. One feels the harmony of being worlds away from lifes every day hustle and bustle, but surprise this charming retreat is just mere steps away from the renowned boutique waterside shops and artis center for the performing arts! Enjoy all the 1st class pelican bay membership privileges: 2 miles of beach to call your own, 2 gulf-front beach clubs with open air casual & formal indoor dining, attended beach services, 2 tennis centers, state-of-the-art fitness, life-long learning center, canoeing, kayaking, & miles of walking, biking & nature paths. Stunning remastered villa like new construction!! Every inch is new! This exquisite property is ready for your viewing. The villa has a new second floor addition with superstructure framing, new copper roof and guest suite. All new impact windows and doors, mechanical systems, custom kitchen (kitchen by clay) and laundry include all new appliances. Outside the master bedroom is a new plunge pool/hot tub/water feature with small grass sitting area. With the second-floor addition, this 4 bedroom, 4 bath home is now 3,186 sq. Ft. , meets all current codes, and has the value of new construction. Masterfully designed and an absolute pleasure to see! Remodel or tear it down and build new! Beautiful home on a trophy45 acre cul-de-sac lot located in prestigious pelican bay woods. This large estate home has an open floor plan with over 4,000 sqft of very usable living space. Key features include a first floor master with an oversized bathroom, volume ceilings and marble floors in the common areas, chef's kitchen, and views of the backyard and pool from almost every room. The outdoor living space is perfect for entertaining with a large pool deck, crystal blue oversized pool, summer kitchen, and plenty of green space and lush mature landscaping providing for complete privacy. Tucked away from any main roads, you and your guests will not be disturbed by road noise. This home also comes complete with a membership to pelican bay. Members enjoy two private beach clubs with restaurants and bars at each, har-tru tennis courts, a fitness facility, access to kayaking through the mangroves, and much more. Schedule your private showing today.